A leaf cutter resting: note the scissors! 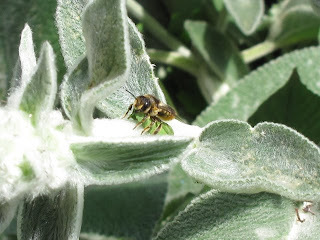 The other day I was watching Wool Carder bees when another bee landed in a plant next to the Stachys. 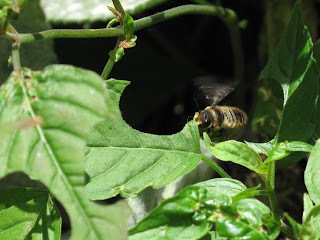 It was a Leaf-Cutter bee, who proceeded to honour her name and started cutting a circle in a leaf. As I was there, kneeling, ready and close by I took a first shot thinking that I would have time for more. But the next shot was a blur of the bee carrying the leaf away once she curled it under her body! They are so fast cutting as if they had scissors. 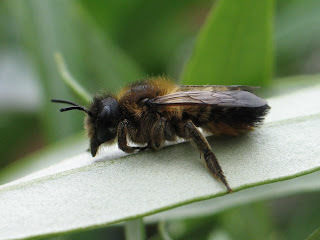 There are eight leaf-cutter bees in the UK all of the genus Megachile. Unfortunately, identification is not easy from live individuals and this has hampered research into them. 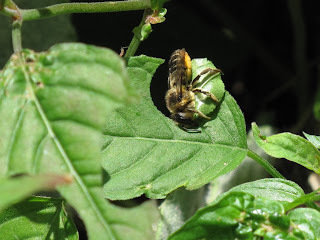 I could identify the plant the bee used to cut her circles of leaves as Circaea lutetiana, with the delightful common name of the Enchanters Nightshade. It is a plant that grows on its own accord in the garden, in shady places, that covers the ground and has pretty tiny flowers. After the multiple visits by the leaf-cutter, the plant has now been left in a sorry state. I thought that leaf-cutters preferred roses, but my roses are untouched. Fabre dedicated a chapter of his book Bramble Bees and others to the leaf-cutters. As it is a recurring theme in his book, he marvelled at the ability of the leaf-cutter to cut perfect circles and ellipses of leaves of different sizes depending of their use to build her nests. He also contrasts the instinct of the bees - the use of leaves for nest building - with the plasticity of the actual choice of plant species depending of their properties and availability. Leaf-cutters use existing holes to build nests. Given that my bee posts have now been covered by plant growth and I cannot see what's going on in them we have made a new bee hotel, in the hope that summer bees will be tempted to use it. I'll keep you posted. Megachile sp. 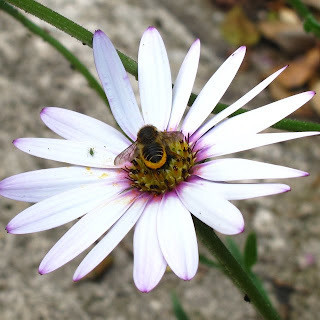 feeding on Osteospermum, the pollen filled scopa underneath her abdomen is clearly visible. These bees often keep their abdomen lifted up when feeding. 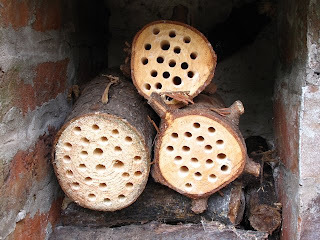 The new bee hotel: vacancies. Thank you Jane! The garden is really buzzing now. It's hard to choose what to post on.